When you're looking for a job online, having a copy of your resume online can save you lots of time. It can also help potential employers find you, and see your skills and experience. Indeed.com's resume service enables job seekers to upload an existing resume or create a new resume using their resume-building tool. This allows users to quickly post their resumes when applying for jobs. Users can also make their resume visible to employers. This way, if a hiring manager sees your resume and thinks you are a good fit, he or she can reach out to you. Learn how to use Indeed’s resume service, and how to make your resume stand out from the crowd. First, you need to sign in to Indeed.com or create an account if you're not already registered. Then, upload your resume. Indeed recommends uploading the following file formats: Word (.doc or docx), PDF (created from a text file, not a scanned image), RTF, and TXT. Have your resume file saved in one of these file formats so that it is ready to upload from your computer. Have your contact information, work history, and education ready to enter. Indeed will ask you to fill these sections out first as a way to get started. If you don’t want to fill these out first, you can skip these sections. You can edit particular sections of your resume, and even add or remove sections. Indeed offers suggestions for other sections to add to your resume, including “Skills,” “Awards,” and more. Click “View & Edit Resume” to view what the final copy of your resume will look like when employers view it. Once your resume is on Indeed, you can choose to make it “Public” or “Private.” There are benefits to both options. When you make your resume public, it is visible to anyone. Visitors to a public resume page can forward, save, or download the resume as a PDF or email you through a secure contact form. Your street address is visible only to you, and your phone number and email address are only visible when you apply for a job. One benefit of a public resume is that hiring managers can find you and reach out to you if they think you might be right for a job. This is a good option if you are unemployed, and do not care who sees that you are job searching. When you make your resume private, employers cannot find your resume, so they cannot contact you if they think you might be right for a job. They can only see your resume when you attach it when applying for a job. This is a good idea if you are employed, and you do not want your boss to be able to find you and see that you are job searching. 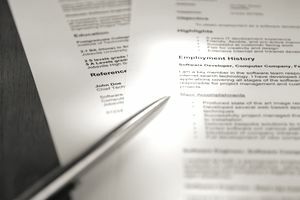 Whether or not you make your resume private, you can still download a copy of your resume for your records. If you don't want your resume online any longer, or if you want to start with a new document, click on “Remove your resume & profile” and it will be removed from the system. If this is the only version of your most current resume, be sure to download it before you delete it so you have a copy. When searching for jobs, you will see that some jobs that say “Apply with your Indeed Resume.” This means that when you click “Apply Now,” you can include your Indeed resume in the application. If you choose to apply with a different resume, simply click “Apply with a different resume.” You can then click “Choose File” and upload the file you want to use as your resume. If a job doesn’t have the “Apply with your Indeed Resume” link, it likely means you have to apply for the job directly on the company’s website. Employers looking for job candidates can search through public resumes by job title, company, education, location, or keyword. They can then download a resume as a PDF or email the job seeker through a secure contact form. Indeed.com users can also forward resumes to colleagues or other contacts who might be interested in a particular user’s resume. You can also choose to promote your Indeed.com resume on Facebook, LinkedIn, or Twitter. If you are comfortable making your job search public, this is a great way to increase the visibility of your resume, and use your social network to promote your job search. Read samples. Before starting your resume, check out some sample resumes from people in your industry. Also, look at some of the public Indeed resumes. You can search by job title to get a sense of what other people in your field include in their resumes. Consider adding a headline or summary. Under the “Basics” section of the Indeed resume, you can include an optional headline and summary. A headline is a brief phrase that highlights what makes you stand out as a candidate. A resume summary is slightly longer – a couple of sentences or bullet points – and goes into more detail about how you might add value to a company. Consider adding one or both of these as a way to show hiring managers, at a glance, why you are a great candidate. Know what employers are looking for. Because you are using one resume for many jobs, you want to make sure the resume is tailored to the specific industry in which you are job searching. Make sure you know the skills and experience people in your industry are looking for in job candidates. Read some job listings on Indeed in your field to get a sense of what hiring managers want. Then, highlight relevant experiences and skills in your resume. Emphasize achievements. In your descriptions of previous jobs, emphasize not simply what you did, but what you achieved. Whenever possible, quantify your achievements. For example, say how much money you helped a company make, or explain how your new filing system increased efficiency by a certain percentage. Numbers show an employer, at a glance, how you will add value to their company. Fill out all relevant information. Indeed provides a number of options for resume sections, including “Awards,” “Links,” “Patents,” and more. Fill out all relevant sections. For example, if you are applying for a job in academia, fill out the “Publications” section with any articles or books you have published. However, don’t fill out sections that are not relevant to your industry or your experience. If you have no military experience, for example, skip the “Military Service” section. Edit, edit, edit. As always, thoroughly edit your resume before uploading it for a job, making it public, or sharing it with someone. Click “View & Edit Resume” to see how it will look to an employer. Proofread the resume, and consider asking a friend or family member to look it once over as well.